Underworld is not the same now as it was in the past. Underworld is using more lethal armoury than ever before, and Mumbai cops have not been able to reach the level of mafia’s ammo store. The Mumbai gangs are using a variety of arms – right from the traditional weapons like the ‘Rampuri chakku’ to sophisticated guns like AK-56 and 9 mm Glouks pistols. Their arsenal comes in handy to kill either members of the opposite gangs or their ‘bakras’ (victims). It is not very difficult to buy a weapon in Mumbai. There are many suppliers in Malvani of Kandivali, Sakinaka, Nalasopara, Nagpada, Dongari, Mumbra and Taloja. Some of them are dealers, to supply arms to the underworld shooters on competent prices. Some years back in 1999, when Mumbai police caught the largest number of weapons, a new trend started in the underworld. Suppliers started providing arms on hire too. The shooter had to deposit the cost of the weapon with supplier and after an operation operation ended successfully, the shooter could return the weapon and get back his money minus the rental charges. However, if a shooter was caught red handed or misplace the weapon, the supplier did not have to refund the security. Currently, Mumbai mafia is using Pak and Afghan made Star pistols, German, Japan, Sweden and France made .38, .42 or .48 calibre pistols and revolvers, China made AK-47 or AK-56, and India made 9 mm Sten guns (normally used by police, army and other govt. agencies only). Pak and Afghan made 9 mm. Star pistols are very popular weapons in Dawood gang. It is receiving these sophisticated weapons from ISI and other sources from UP and Bihar. The Dawood gang is also rumoured to have kept large caches of AK class rifles, HE hand grenades and RDX at secret hideouts. This ammunition is said to have been smuggled from Pakistan for the 1993 Mumbai bomb blasts. D-company is using weapons from this stock time to time, such as in the killing of Milind Vaidhya, ex-Mayor of Mumbai and Sihv Sena Corporator. 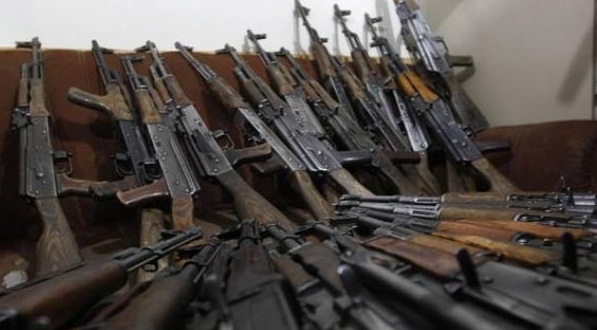 Mumbai underworld is also getting arms and ammunition from various entities like Kashmiri & Khalistani and North-East Indian militants, illegal arms dealers of UP, Bihar, Rajasthan, MP and Pakistan’s Inter Services Intelligence (ISI). The underworld gangs are buying arms from the Afghan frontier too. Nepal is also a big market of illegal but foreign made sophisticated arms. ISI is sending arms from Pakistan via Rajasthan border or from Karachi to Mumbai by sea route. ISI is also using lad routes from Nepal for arms smuggling. Since it has a strong base in Gujarat, the D-Company is using its coastal to smuggle in arms. The main areas from through which illegal arms are reaching Mumbai from Pakistan are Bhuj, Kutch and Bharuch. This intelligence officer further reveals, ‘Arms dealers and smugglers are sending armaments in wood bundles though villagers living along the border. The carriers are usually female, as the police and customs officers are less suspicious about them. After reaching the Indian border, they load these wood bundles in trucks, which transport them to Lucknow or Patna.’ He also says, ‘Mujaffarpur (in Bihar) is also an old hub to supply arms from Nepal to Mumbai.’ In the normal course too, Customs officers are not able to check each and every person crossing the Indo-Nepal border. Arms carriers cross borders from rice fields, foothills or rivers. In Pakistan, an AK 47 or AK 56 rifle is available for as little as Rs. 8,000 in Indian currency. Some time back, an arrested leader of Guwahati Nationalist Socialists Council of Nagaland, told the police that the outfit is selling arms to the dealers and smugglers located in other part of India as well. He confessed of having some links in Mumbai underworld too. As the high end weapons that reach Mumbai through the above mentioned routes, they are available for sale in the metro thereafter. Unlike the earlier days when the weapons offered were limited to Rampuri chakus and country made revolvers, today sophisticated weapons like AK 56 and 9 mm can be bought in Mumbai itself. Purcahsing Glouks pistols is not a dream any more; you just have to fund a greedy man of weaponry market in the Jhopadpatti of Dharavi, Pathanwadi (Malad) or Malwani in Kandivali suburb. The price could range anywhere between Rs.4,000 to 4 lakhs, depdnding on what you what and how urgently you want it. Guns apart, other deadly weapons such as Rampuri knives (without buttons) are available for Rs.50 to Rs.75 and the buttoned ones are available for Rs.100 to Rs.200. A chopper has same price tag but swords may cost 3 to 4 time more. In the firearms section, a Desi Katta (country made one round pistol) can be procured for an amount ranging between Rs.1,500 to Rs.2,200, and a Desi revolver (country made 5 to 7 round revolver) between Rs.5,000 to 10,000 in Mumbai ‘Saman Bazar’. A factory made-Indian revolver is available in the range of Rs.25,000 to 35,000, but foreign made revolvers costs around Rs.1,25,000 to Rs.1,50,000. Foreign makes include Pak and Afghan made Star pistols, and Germen, Japan, Sweden, France made .38, .42 or .48 calibre pistols and revolvers. The underworld sharpshooters generally use automatic and semi-automatic pistols. A factory made automatic Indian pistol costs around Rs.1.5 to Rs.2 lakhs, and a foreign make in the same category could cost anywhere between Rs.2.5 to Rs.4 lakhs. The gangs also use China made AK 47 and AK 56 rifles. An AK 47 costs between Rs.1 lakh to Rs.2.5 lakhs, and an AK 56 rifle would cost 10 to 20 % extra. The underworld people generally do not use India made 9 mm Sten guns or carbines, and if any gang chooses to use these weapons then it has to purchase these in other states. 36 HE Hand grenades are also have a presence in Mumbai, but are not available for sale. The grenades are now with D-company only, and are a part of the arsenal that it had smuggled for the serial bomb blasts. The availability of all these weapons gives rise to a natural demand for bullets of various bores, referred to as ‘dana’ in the underworld lingo. All kind of bullets are also available in Mumbai, and cost anywhere between Rs.25 to Rs.150 per bullet.